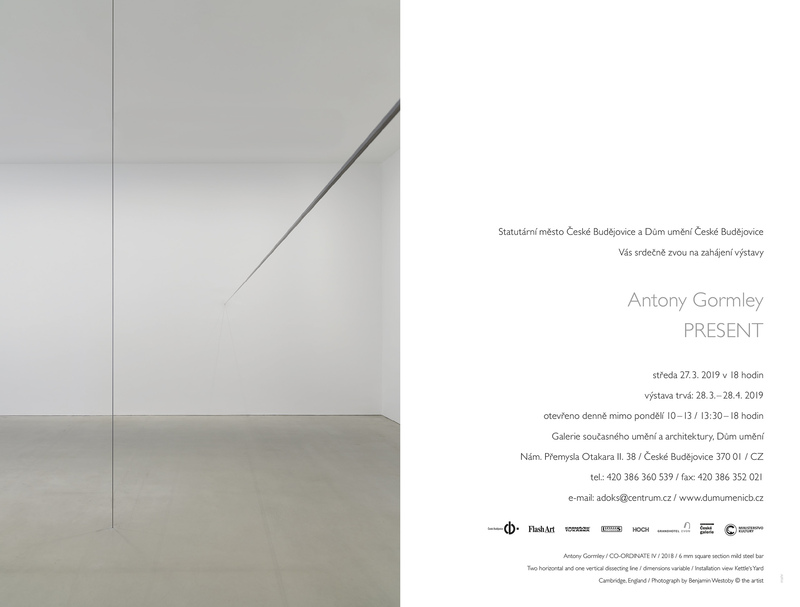 It is a great honour to welcome the internationally renowned British sculptor, Antony Gormley, to České Budějovice. The main subjects of his work are the interior space of the body and the human body’s relationship to space at large. Gormley consistently seeks to identify artistic space as a place – with the possibility of creating new ideas, emotions, and situations. Working primarily with his own body, he explores basic questions regarding man’s relationship to nature and the cosmos. He searches for new ways of understanding this issue through a constantly evolving practice that also acts as a diagnostic tool for exploring our existence in this world. For Gormley, an important factor is always the space in which he shows his work, which are never randomly conceived but always based on how the space affects him and the associations it evokes. He often works with the body as a dwelling, inviting the viewer to participate in the creative act. According to Gormley, working with space is more important than what the sculptures depict. 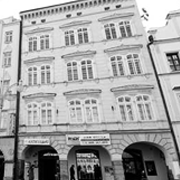 This approach is further confirmed at his České Budějovice exhibition PRESENT, conceived in response to his site visit last year. Gormley pulls us into his field of experience, where we are confronted with space through his own personal journey through it. 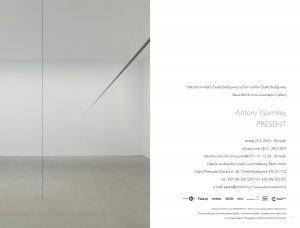 The exhibition consists of two works, Coordinate and Edge, which activate and disrupt five spaces in the House of Art: Coordinate consists of steel bar: long, tension-filled lines that span the spaces and affect both the space and the viewer while objectively measuring the space that we share with it. Two horizontal lines stretch through the gallery, one at the eye level and the other above head height. They intersect at a 90-degree angle to form a cross that connects two entirely separate spaces. A third, vertical line bisects another room. From some angles, these vectors seem to intersect; from others, they appear to diverge. All three sculptural lines are like the finely tuned strings of a musical instrument. They are an expression of the rooms’ continuity and discontinuity, of their light and volume, but they also hint at the space’s continuation beyond the walls. Edge is a body made of cast iron weighing 630 kilograms, horizontally attached to the wall at the height of a sleeping person. With this unusual placement, Gormley rotates the situation by 90 degrees, thus showing how the stability of the world and our orientation within it are relative concepts. Through his sculptures, Gormley activates the space they occupy – and us as viewers as well. His works offer the possibility of physical and metaphysical encounters that explore our relationship to a given space while being aware of the body and its movement. “My aim is for the sculpture to be an immobile place within a changing world. Through our confrontation with it, we can strongly feel our own existence. That is the only reason why I create a sculpture.” A. G.
Sir Antony Gormley was born in 1950 in London. He studied archeology, anthropology, and art history at Trinity College in Cambridge, after which he spent several years in India and Sri Lanka in order to learn more about Buddhism. On returning home, he completed his studies in 1979 with a post-graduate course in sculpture from University College London’s Slade School of Fine Art. He has held countless solo exhibitions throughout the world, including: Kettle’s Yard, Cambridge (2018); Long Museum, Shanghai (2017); National Portrait Gallery, London (2016); Forte di Belvedere, Florence (2015); Zentrum Paul Klee, Bern (2014); Centro Cultural Banco do Brasil (2012); Deichtorhallen Hamburg; State Hermitage Museum, St Petersburg (2011); Kunsthaus Bregenz (2010); Hayward Gallery, London (2007); Kunsthalle zu Kiel; Malmö Konsthall (1993); and Louisiana Museum of Modern Art, Copenhagen (1989). This September, he will have a major exhibition at London’s Royal Academy of Arts. He is the winner of the 1994 Turner Prize and was awarded the Order of the British Empire in 1997. Gormley has also been a member of the Royal Academy of Arts since 2003 and was knighted by Queen Elizabeth II in 2014.